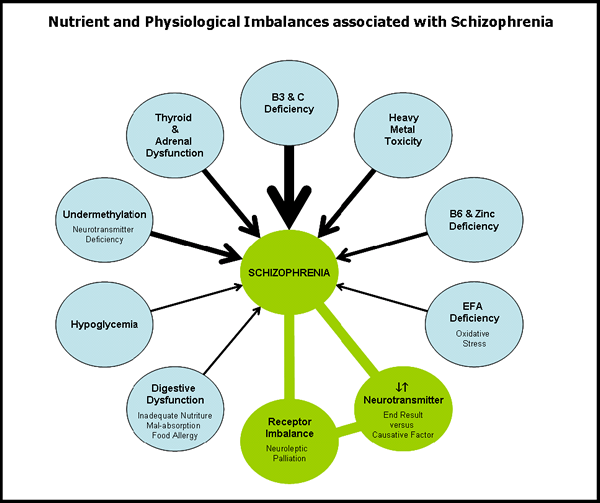 Schizophrenia is associated with specific nutrient deficits and physiological imbalances. The orthomolecular treatment of schizophrenia involves correcting the biochemical imbalances illustrated below. Our orthomolecular nutrient-correcting protocol for schizophrenia has shown a track record of consistent positive response in a wide spectrum of mental health conditions. This includes the significant portion of First-Episode Schizophrenic (FES) patients that we have treated. By assessing patients with specific lab tests and targeting our treatment accordingly, we have found that a significant portion of patients are good responders. One of the early signs in a good responder is smiling and being involved and motivated to participate in family life. “I feel like a new person”. My REVIEW ARTICLE ON SCHIZOPHRENIA - 2008 - Part 1 and REVIEW ARTICLE ON SCHIZOPHRENIA - 2008 - Part 2 publications in the Journal of Orthomolecular Medicine describe the approach and how respective nutrient and physiological imbalances can be treated.